Moving gears! Spiced-up Indian engine for V2 fans. Large white triangle is battery indicator. Unleaded only! Smooth and fast gear action! 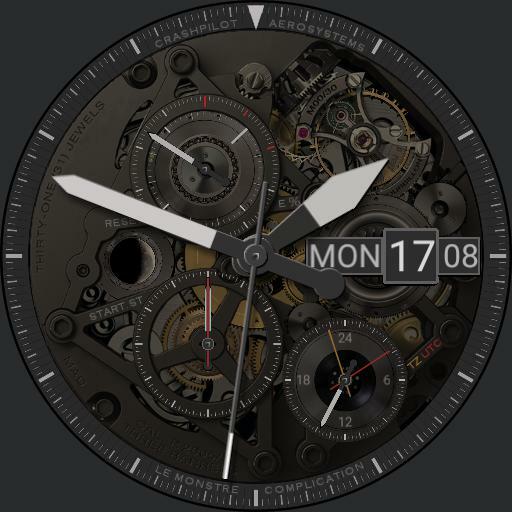 Integrated moving parts, 1/100 second chrono, compass, battery level, 24hr display, 3 analog time zones and full date. Aviator design make-over for a Swiss classic. Next-gen hybrid movement with octa-core processor. Comes with diagnostic software! Moving gears! Large white triangle is battery indicator. FAA certified supercharged 9 cylinder 1300hp evolution radial. Cleared for take-off! Smooth and fast gear action! 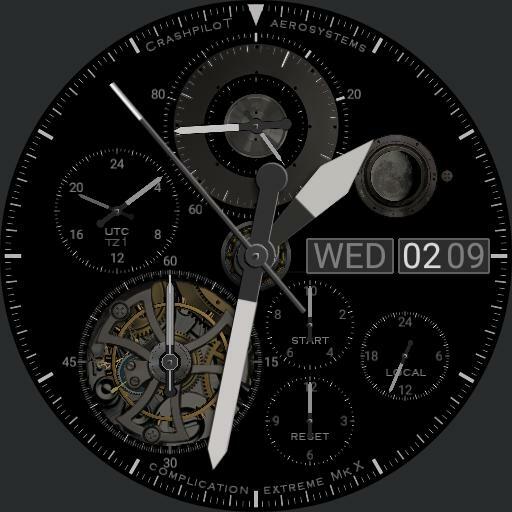 Integrated moving parts, gyro compass, sweeping-hand chrono, battery level, moon phase, time zones 1+2 (UTC), 24h marker and full date. The complicated monster. Modern facelift for a Swiss classic. 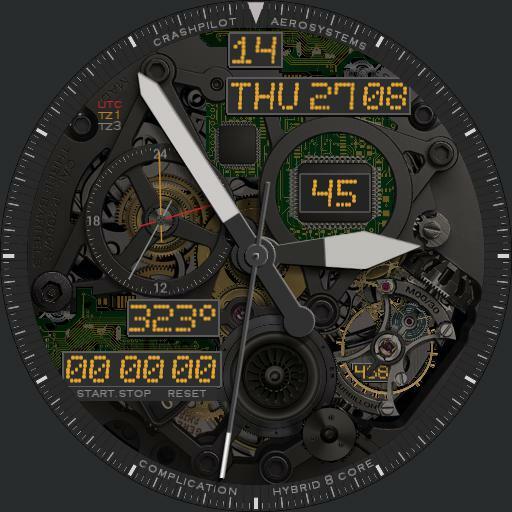 Multi-function co-axial analog displays and digital date for better readability. See your local watchmaker for repairs! Smooth and fast gear action! 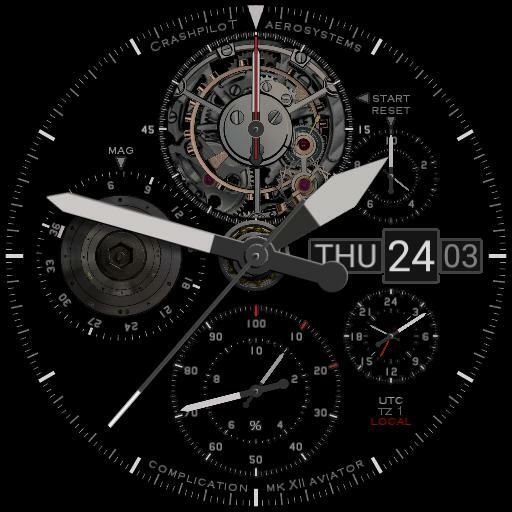 Integrated moving parts, sweeping-hand chronograph, battery indicator, 24h and full date. Modern facelift for a Swiss classic with twin-balance movement. Needs winding-up! Moving gears! FAA-certified supercharged 1300hp Evolution 9-cylinder radial. Large white triangle shows battery level. Cleared for take-off! Smooth and fast gear action! 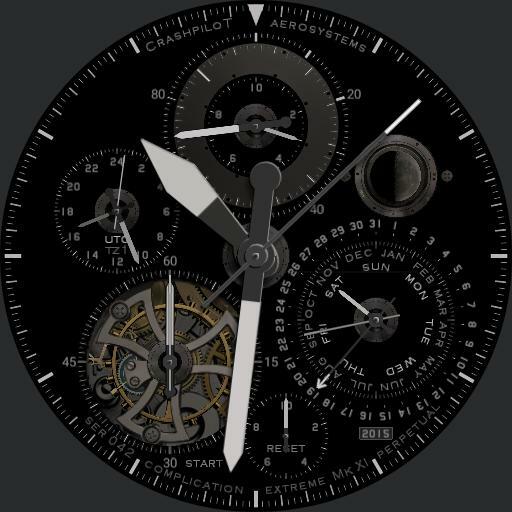 Animated see-through movement, 1/100sec sweeping-hand chronograph, gyro compass, battery level, Moon phase, 2 timezone indicators, 24hr display and full date. 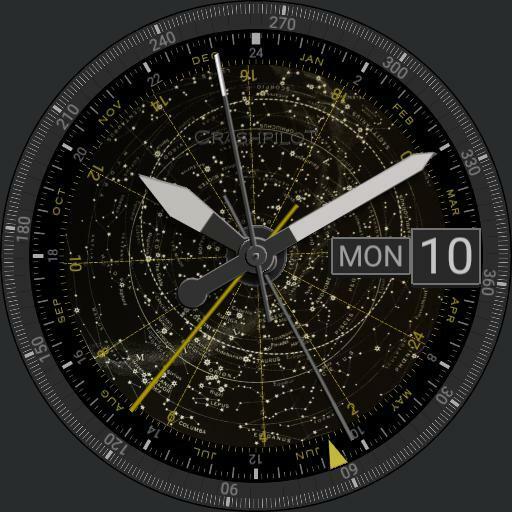 Android-facelift for a Swiss classic. Extreme analog functionality for those who want everything on one dial. Comes with 642 page repair manual! Moving gears! 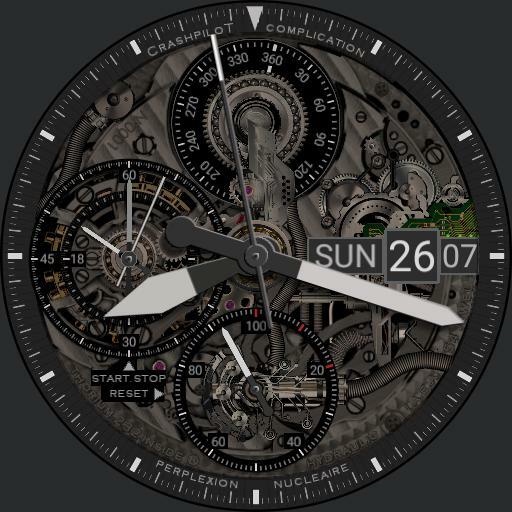 See-through movement, 1/100sec chrono, compass, battery level, Moon phase, timezone 1and2(UTC), 24hr marker and classic perpetual calendar. 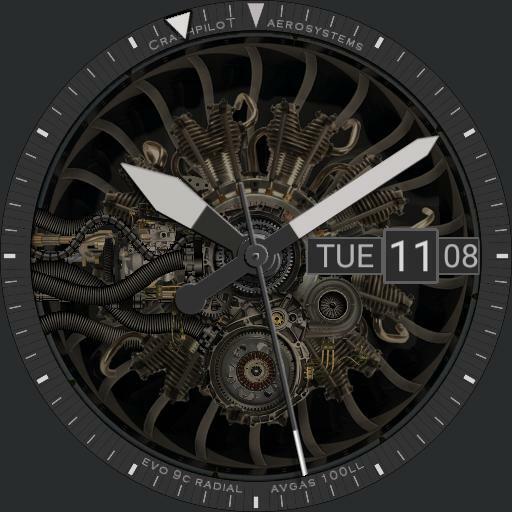 All vital analog functions on one dial. Comes with 672 page repair manual! Best with black background. 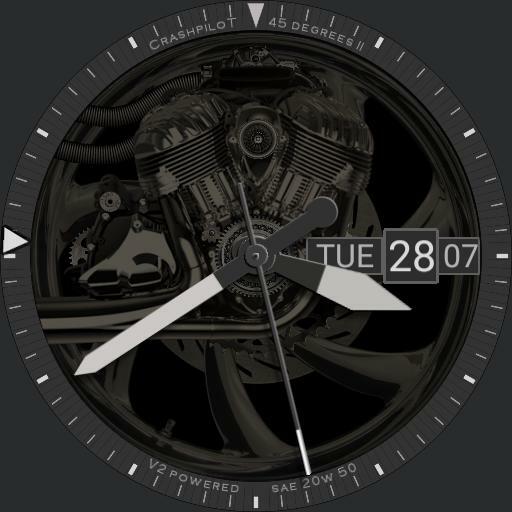 Resize to fit any watch shape. 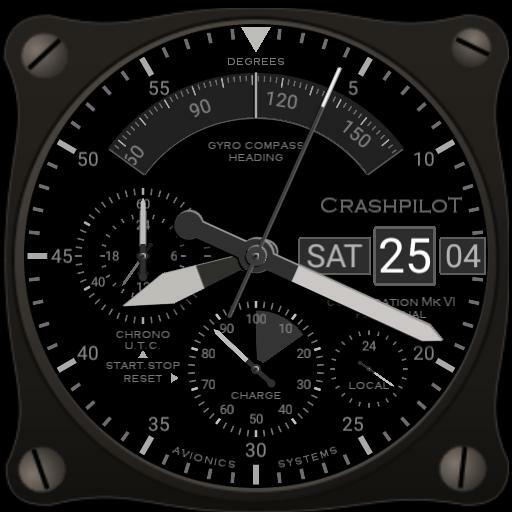 Large gyro compass, chronograph, full date and time zone. Never get lost again! Smooth and fast gear action! 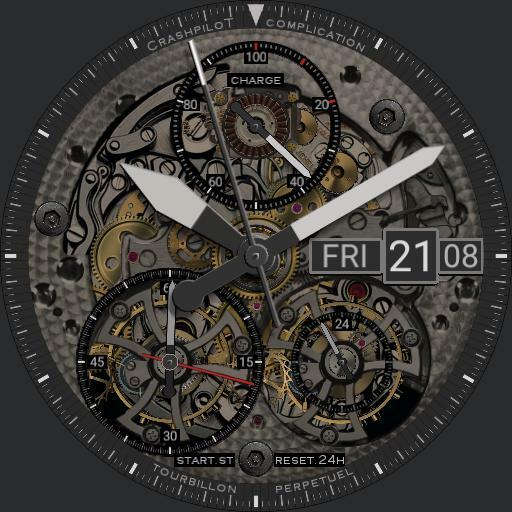 Integrated moving parts, gyro compass, sweeping-hand chronograph, battery level, 24h and full date. The first hydraulic watch ever! Nuclear powered for your convenience. IAEA certified thorium 232 reactor. High pressure liquid nitrogen powered beryllium gyros. Makes no noise. Comes with lead gloves and radiation counter! Smooth and fast gear action! 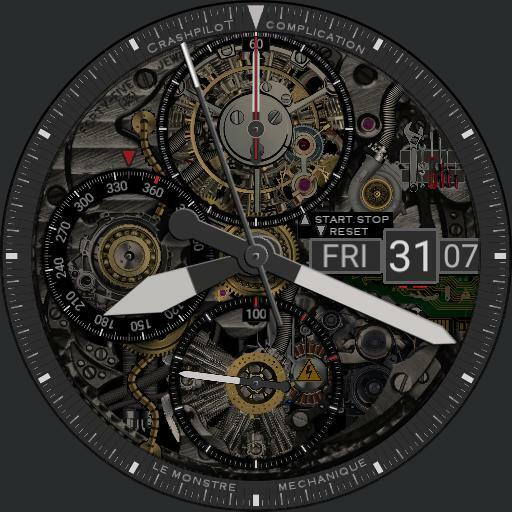 Animated see-thru movement, gyro compass, 1/100 sec chrono, battery level, timezones 1+2 (UTC), 24hr marker, millisecond balance indicator and full digital date. 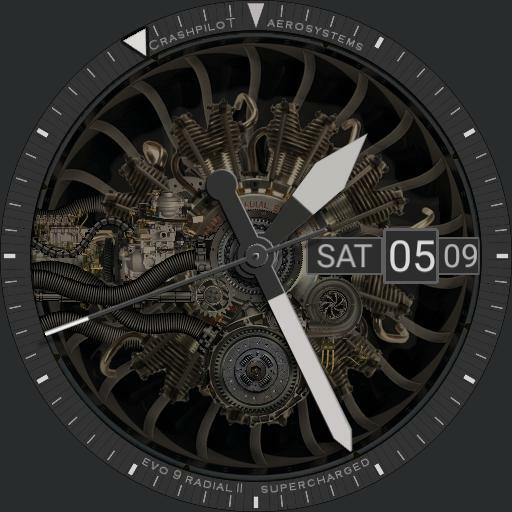 Android upgrade for a swiss tourbillon classic. 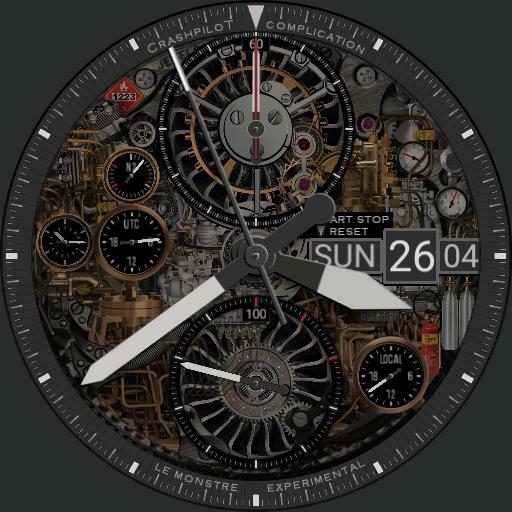 See your watchmaker for repairs!